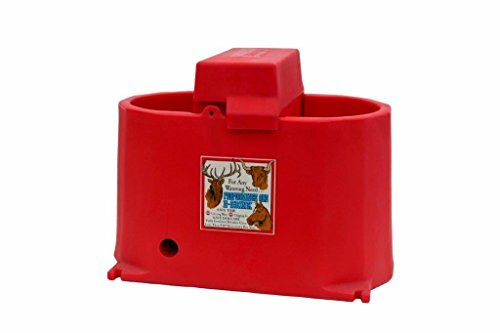 Brower MPO17N 17-Gallon Unheated Poly Waterer, Red | Fountain City Art Ctr. Model MPO12E Performance One E-Drink is electrically heated and energy efficient. A typical heating bill--$10.00 or less. Why? Two reasons. Our drinker has 12 gallons of capacity. Incoming water carries heat energy. The more water, the more heat. Our R-value of 7-1/2 per inch holds the heat provided by incoming water. Second, our supply line is in the water. You don't need extra heat to keep the line above the ground open. You do need proper installation to prevent the supply line underneath the drinker from freezing. Similar to Model MPO17E but with an access door. 2-2 inch drains and 1 threaded bottom port for optional inside drain. 2 large drink openings 8-Inch x 14-Inch each. Drinker wells are 14-Inch deep allowing most any animal to drink naturally. Waters up to 150 head of most any species. 100% poly construction. Molded with the most effective ultraviolet inhibitor. Tough enough for years of outdoor use. Notched flanges for easy anchoring. Over 300 square inches of access for easy hook up. Stainless steel spring loaded valve cover removes easily. No loose parts to lose. Proven (15 years of use) 250 watt heater, dependable non-siphoning Durapride valve. Sealed bottom keeps out moisture and rodents.